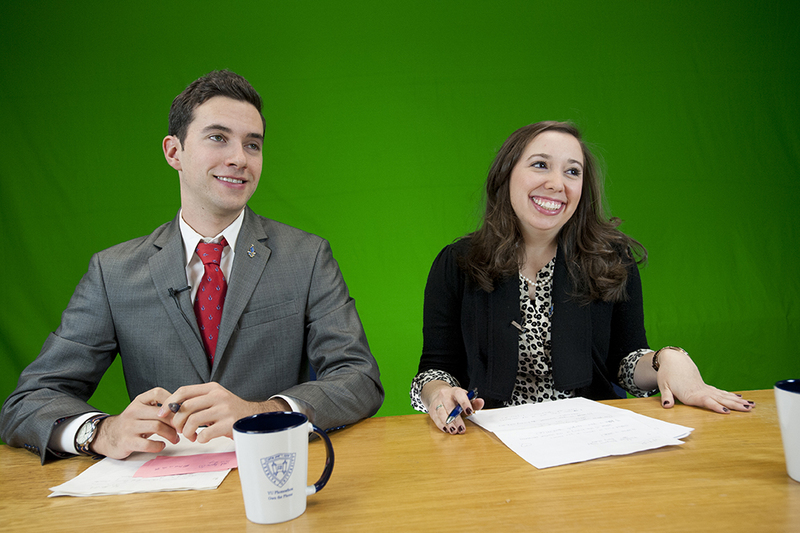 These days, The Shield News team—Yeshiva University’s student-run news video broadcast—is a well-oiled machine. For instance, they’ve gotten their popular “Week at a Glance” videos, which keep YU students up to date on the academic calendar, extracurricular events and university athletics news, down to a science. In the beginning of the week, producer and Yeshiva College senior David Bodner takes a look at the YU Events Calendar, selecting the most talked-about upcoming events for a script to be built out by a team of student writers and writing editors. Then anchors Benjamin Scheiner ’14YC and Shimra Barnett ’15S join videographers Ari Hagler ’16YC or David Khabinsky ’14YC at the team’s studio in the Schottenstein Center, where they draw on many of the modern staples of broadcast news, such as a green screen and a teleprompter, to give their broadcasts a professional look and feel. Scheiner and Barnett do take after take as Bodner watches, correcting them if they forget a line or prompting them to add something if it sounds better. Then Khabinsky, who also serves as video editor, works late into the night to perfect the film, cutting and editing until the team has a polished video that’s ready to help students on both campuses kick off their week when they check their inboxes Monday morning. All in all, the enterprise has grown to include some 11 students and produce dozens of videos garnering hundreds of views each. 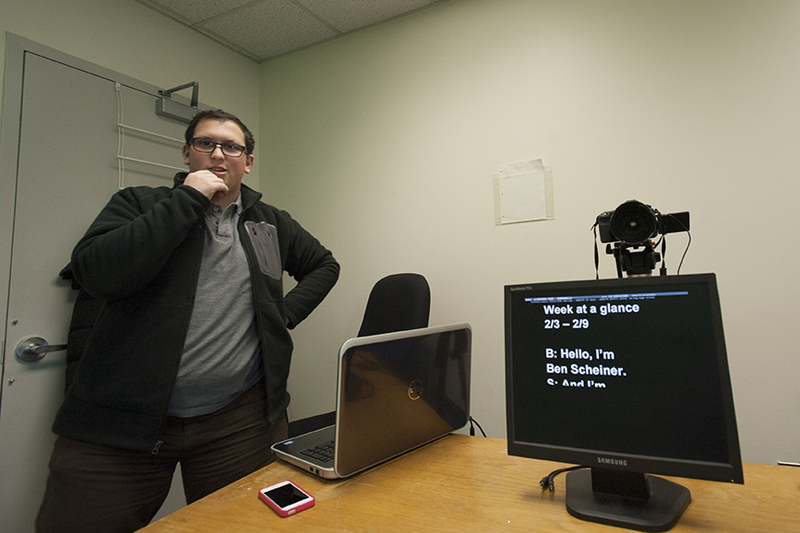 It’s come a long way since the day in 2011 when Scheiner, then in his first year at YU, began thinking about a way to combine his passion for news and news-anchoring with his desire to raise school spirit. So, with then-fellow student Benjamin Shai ’12YC serving as his video editor, Scheiner put together his first video: a brief history of YU and a tour of the Wilf Campus. It was well-received, and in the year that followed, Scheiner slowly began to film more videos with the increasing collaboration of other students intrigued by his idea—Yehuda Silbermintz ’13YC helped with shooting and editing, Rafi Skier ’13YC drafted their signature music and logo. 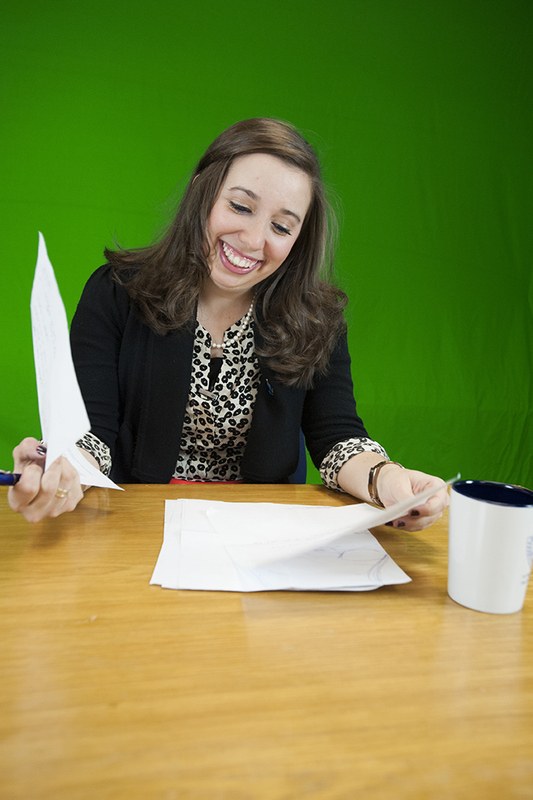 In the spring of 2013, Netanya Bushewsky ’13S signed on as Scheiner’s co-anchor, coining the team’s catchphrase “Here’s to you, YU” and bringing with her other Stern College for Women students who were interested in participating. Shield News coverage that year included breaking news coverage of Hurricane Sandy, interviews and feature stories. But it wasn’t until Bodner and Khabinsky came on board that same spring that the team really solidified. In Bodner, Scheiner found an ABC-trained news producer: Bodner had interned in the community affairs department at the news station the summer before, where he wrote the weekend calendar script that anchors would read on air. Khabinsky also brought solid experience to the group, having secured an internship through YUCareerLink with a videographer for popular blogger Jew in the City the previous year. Both were passionate about news and video, and both were excited to bring their own ideas to the table to expand Shield News in new ways. Week at a Glance was one of the first new features. “That came about because Ben and I were on the phone and I was looking at our schedule of classes, which is called ‘Your Week at a Glance,’ and I thought, ‘We can do this with events,’ ” Bodner said. Looking back at the last year, the Shield News team is proud of their hard work, as well. Their videos are now featured in a special tab on YU’s events page and circulated widely on campus, and there have been some real coups. “I thought it was very cool that we had an interview with [musician] Alex Clare,” said Scheiner. “The guy has celebrity status. I was nervous to do the interview and do it well. From a reporter’s perspective, I was very proud that the administration was able to help us get that interview, that David [Bodner] coordinated it and I was able to execute it.” The interview received over 400 views. As the new semester gets underway, Shield News already has an exciting lineup planned. They’ll be reporting live for three days from YU’s National Model of United Nations and covering Cake Wars and Yom Ha’atzmaut, among other events. 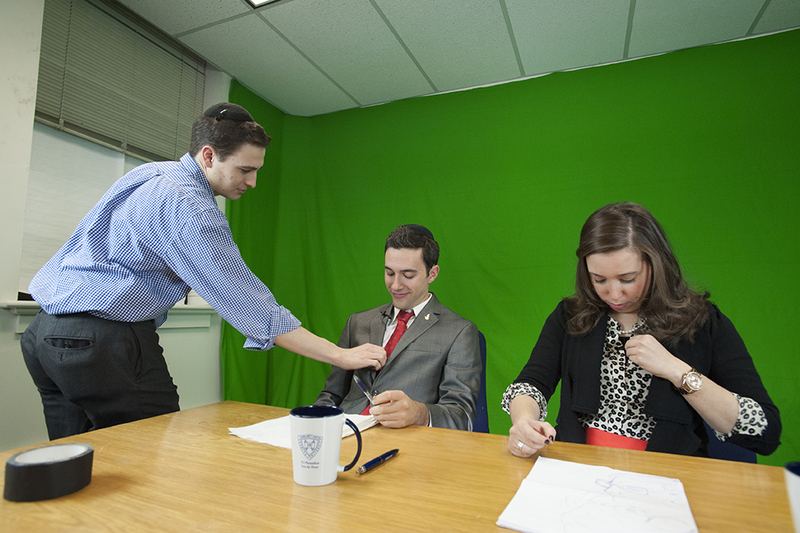 They’ll also be training a host of new students in everything from anchoring to video production as Bodner, Scheiner, Khabinsky and other senior members of the team prepare to graduate and hand the reins over to a new generation of Shield News. As Khabinsky put it: “The new horizon is that we’re not only learning, but teaching others what we have learned.” Barnett will stay on as lead anchor as she continues to develop her own style—“I’ve been watching a ton of Ellen, which I learn a lot from”—and draw on her background as a speech language and audiology major. “It’s all about the power of words, in the end,” she said. As for Scheiner’s anchoring style, no surprises there: “It’s definitely a combination of Ron Burgundy and Stephen Colbert,” he said. Want to get involved with Shield News? Email the team at theshieldnews@gmail.com and watch their videos.